I love to cook, and I love that there are millions of recipes available online. However, there is only so much you can tell from a pretty picture and a list of ingredients. I hate spending time and money to then find out the dish wasn't really worth either. That is why my favorite sections of a recipe site are the reviews! Most people spend time reading reviews for large purchases or for electronics but not for items they use everyday. We tend to stick with what has worked and often miss out on a product that just works better than what we are currently using. But where do you find reviews for everyday things? The answer is Have You Tried This Yet? from P&G. Have You Tried This Yet? from P&G is a site that highlights innovative products meant to improve everyday life. Not only can you read about products from brands like Crest®, Olay®, Pampers® and Tide®, you can also request samples and coupons and check out reviews and advice and tutorials from consumers like you. And it is all as easy as a couple of clicks away. Want even MORE savings? The products highlighted on Have You Tried This Yet? are also the same products you will find in the brandSAVER coupon booklet that is distributed in your local Sunday newspaper. It features over $80 in savings on the campaign’s featured products, so you can try them all out and save even more money! When cooking and baking with my kids, the three extra sets of hands create three times the mess. We stay on top of it with the help of a lot of paper towels. It wasn't uncommon for us to go through half a roll of other brands. The paper towels never tore off the roll easily and once they were wet they were pretty useless. Until I checked out Have You Tried This Yet?, I didn't realize Bounty® offered all of their durability in a single ply value paper towel, Bounty® Basic. They are perfect for all of the little spills that happen when cooking with kids and the mess and germs can all be thrown away. It fits perfectly into our family cooking routine and makes dinner clean up so much easier because it cleans the mess with less. How would Bounty® fit into your everyday life? Leave a comment letting me know and you will be entered for a chance to win a $100 Visa Gift Card. Bounty Paper towels would help me clean up after my kids when they are done eating or working on art & crafts projects. Bounty towels are a fixture in my life...cleaning up after kids' messes and the dog's paws. My mom always bought Bounty because it worked better than all the other brands, and because of that, I always buy it too! With 7 and 4 year old boys we go through a lot of paper towels. Bounty would give me more picker upper power for my money. With Bounty paper towels I would clean up after my messy boyfriend! With Bounty Paper Towels, I would easily be able to clean-up all the food messes from my 2-year-old! I keep children in my home so there are always messes to clean. Love the select a size as we don't always need a full sized sheet. I already love the "regular" Bounty paper towels, but would love to try these, too. I would keep them in the kitchen and use them for cleaning and dusting around the house. I live alone and the Bounty Select-A-Size paper towels fit perfectly into my life! I LOVE them! I use bounty all the time. Love it! Bounty fits into my everyday life because it helps clean up messes fast and thoroughly. Bounty will help me stay organized and house clean these holidays; I use Bounty in the kitchen, bathroom, bathroom and everything else. I buy and use Bounty® paper towels all the time in the kitchen. Bounty would fit into my life everyday between the cooking, cleaning, arts and crafts nd keeping the kids loathes cleaner! It would fit in nicely because we use paper towels for everything. I have four kids... need I say more? Bounty paper towels always come in handy at our house. I'm a paper towel grabber and Bounty tears easily and straight. It is strong and doesn't tear apart. I'd use them to clean up all my kitchen messes! bounty paper towels have been a staple in my house my whole life! Wouldn't do without them. 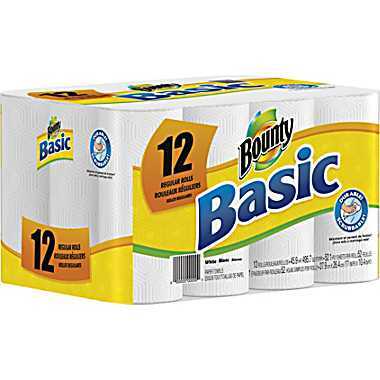 I love Bounty Basic paper towels! I use them for messes that would stain a regular towel and to save myself some laundry time! I am the messiest cook ever, so Bounty paper towels keep me sane in the kitchen! I use bounty to clean everything, kitchen, bathroom, food, ourselves. 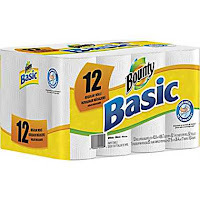 I like bounty basic too because I can use less paper towel. Thanks for the review and giveaway. Bounty helps me clean kitchen mess and make my life easier. I have a 2 year old, so we use paper towels at every meal! i like a reliable paper towel and i trust bounty! Thanks for a chance to win and have a great day! We use paper towels to clean up all kinds of household messes. They are used mostly in the kitchen and the bathrooms. I can't imagine life in my kitchen without Bounty paper towels! They are a must for every day. I use Bounty paper towels pretty often for a last swipe when cleaning up since our cloths leave lint behind. Due to chemo, I have to be careful with all types of germs/viruses, so I keep Bounty in my kitchen AND bathroom, to use instead of fabric towels! I always use Bounty to clean up messes in the bathroom and kitchen. We make a lot of messes in our kitchen - and Bounty would help clean them up! I use Bounty papertowels all of the time for cleaning up our messes in the kitchen! We go through a huge amount of paper towels. It would be great to be able to use less with Bounty Basic. Bounty are perfect for cleaning up after 2 active and messy little boys. I love Bounty paper towels. We use them everyday to clean up all kinds of messes. it would help to serve snacks to my kids! Thanks for a super giveaway! Bounty helps with my messes. Um, how many times a day does one of my kids spill their drink at the dinner table? I don't care to count! While I hate to waste paper and use paper towels very sparingly, there are certain times where they are necessary. I use them for cat mess cleaning and to drain my deep fried foods on. I love Bounty. They are so great for all the little spills that are inevitable. I use Bounty towels for cleaning messes in the kitchen and bathroom. I love using Bounty paper towels. I use Bounty in place of my dish towel to dry dishes, cleans spills and keep my white kitchen floor clean. Bounty is my go to for washing my pup's face in the morning. I know, I know, he's just a dog... but what can I say he loves the gentle cloth washing his eyes and face and then we both sit down - me with my coffee and him with his cookies! Bounty is great for everything around the house.